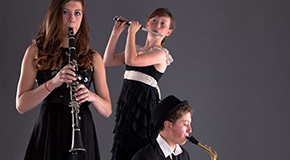 Spartan's first flexible trios, playable by everyone from school ensembles to professional 'wedding' groups. Air on a G String, Sheep May Safely Graze and The Arrival of the Queen of Sheba. Whether for concerts, celebrations or playing together for fun - with over 1,500 sheet music titles for woodwind ensembles, along with classical wind quartet, you will also find a large selection of partly flexible playing material for every difficulty level from duo to 6 and more woodwind instruments from classical, ragtime, jazz, Latin, rock / pop, Christmas, wedding and church music.